This 22-page document includes separate division quizzes emphasizing each divisor from 1 to 12. Each quiz contains 50 problems. These can be used as a quiz, test, homework, math center, or guided review. These can be used weekly in fourth or fifth grade, giving students three or four minutes to complete each test. When a student has shown proficiency, he is given the next test next week. These are also great for challenging high-achieving students who would otherwise be bored while the rest of the class struggles to master their multiplication facts. My favorite part about these sheets is that they have been generated using a carefully designed weighting function so that students see a few more difficult problems than easy ones, unlike some sheets that have an equal distribution of divisors, which overemphasizes simple facts. These quizzes are printed two to a sheet to save trees and printing budgets. 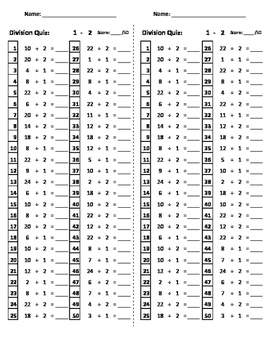 Answer keys are included for teacher convenience. This bundle is similar in function to my Division Tests 0-12: Division-Facts Quizzes Bundle, but it has a different order of problems to keep things fresh. Save 33% when you buy my Division Quiz Mega Bundle. It contains three unique bundles just like this one, which will help you add variety and eliminate cheating. 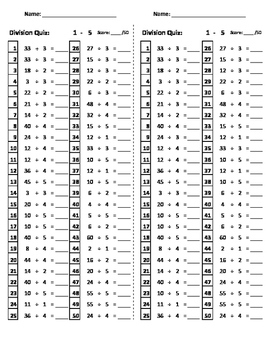 Check out my Division Practice Bundle for worksheets to practice problems with two- and three-digit inputs. Improve your students' addition fact fluency with my Addition Quizzes Bundle and my Addition Blast Off Computer Game. Improve your students' subtraction fluency with my Subtraction Quizzes Bundle and my Subtraction Blast Off Computer Game. Improve your students' multiplication fact fluency with my Multiplication Quizzes Bundle and my Multiplication Blast Off Computer Game. Improve your students' division fluency with my Division Quizzes Bundle and my Division Blast Off Computer Game.